Insight specialises in art education. We run weekly classes and workshop days, helping people to become better painters, including artists, leisure painters and children. Insight runs classes at two venues. The majority of classes are held in our main studio in Whetstone, North London, but we also hold two classes for adults on Fridays in Bricket Wood near St Albans. An address and a map for each venue can be found on our Find us page. How do I get to Insight in Whetstone? 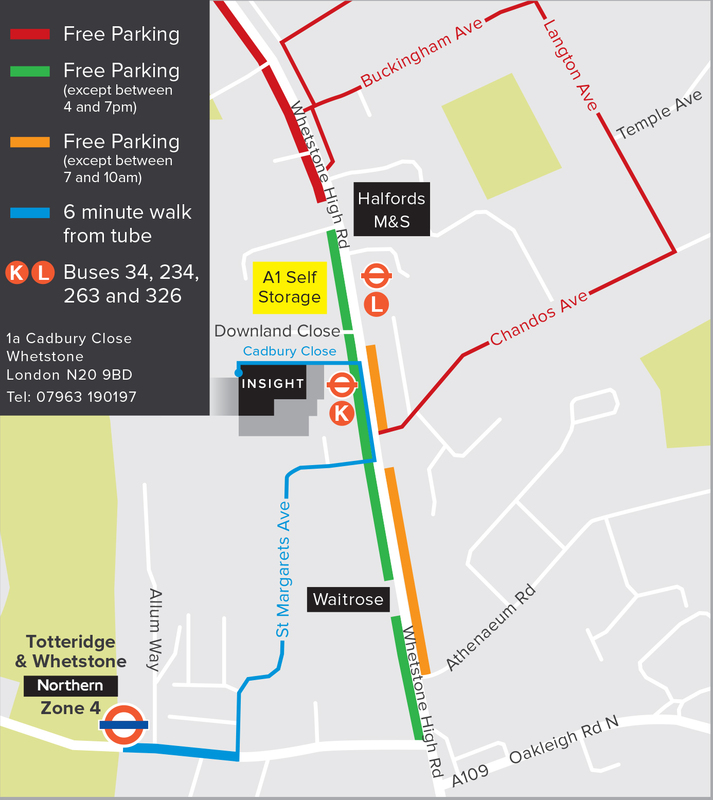 To access the studio in Whetstone you will need to enter the pedestrian gate marked Cadbury Close on the map below. You will need a code to get through the gate so please get in touch if you haven’t received it before the start of term. Once through the gate, walk along the path to the end and turn left. The entrance is in the corner. The studio door will be opened ten minutes before the start of each lesson. Please avoid arriving any earlier. The door will be locked during children’s classes and life drawing, so if you arrive late to your class or you need to collect your child early, please use the door buzzer. Unfortunately we don’t have a waiting area for parents. Please bring your child to the classroom at the start of the lesson and return to collect them at the end. The best way to travel to Insight in Whetstone is by bus. Buses 34, 234, 263 and 326 stop outside the school. Insight in Whetstone is a 6 minute walk from Totteridge and Whetstone underground station, which is on the High Barnet branch of the Northern Line (Zone 4) and a 10 minute walk from Oakleigh Park overground station. There is free roadside parking all day fifty metres north of Insight in Whetstone, in the direction of Barnet, and on most of the roads off of the High Street. On the east side of the High Street, you can park all day from 10am, which is ideal for students coming to classes in the morning, starting at 10.15am. On the west side of the high street you can park all day until 4pm. You can park on any single yellow line on the High Street from 7pm. Evening classes in Whetstone run from 7.15 - 9.30pm to allow time to park and walk to class. Further information about where you can and can’t park with a blue badge is available online. Marks and Spencer’s located opposite the school offers two hours free parking for customers. They have cameras at the entrance to record your number plate. How do I get to Insight in St Albans? Our St Albans classes are held in St Stephen’s Parish Hall, Bricket Wood. There is a map on our contact page. There is a large carpark next to the venue which is free to use. There is a bus stop two minutes walk from the studio on Lye Lane. Bricket Wood train station is also two minutes from the studio, on Station Road. Trains run from St Albans Abbey and Watford Junction. Adults are required to provide their own equipment, except students attending an Introduction class or Life Drawing in Whetstone. Materials are provided for all children’s classes. You will find a suggested list of equipment and materials in the next section of this page. If you attend a class in Whetstone that requires you to supply your own materials then you might like to leave your equipment at the school in between classes. We have dedicated shelving space available for art boxes. If you would like to leave your art box, please make sure that it is clearly named and there is nothing of high value inside. Please note that any equipment left at Insight is done so at your own risk. We also have various sizes of watercolour, acrylic and drawing paper available in our Whetstone studio for you to purchase if you would prefer not to carry an art pad to class. Our studios are turps and white sprit odour free environments. For oil painting classes we recommend using Winsor and Newton Artisan watermixable oils or an odour free paint dilutant like Zest-It. If you’re not painting with a water-soluble paint, we ask that you use your own palette and take it home to clean. Easels, water pots, palettes and boards are provided in our Whetstone studio. What equipment and materials should I bring to class? If you are attending a class that requires you to bring your own equipment and materials, the following list is an example of a suitable starter set. We have listed materials made by Winsor and Newton, but other makes are also available. Oils and Acrylics: Galeria acrylic 20"x16"
How do I contact Insight in an emergency? In the case of emergencies, please call 07963 190197. People attending acrylic, oil or children's classes will most likely get paint on their clothes at some point in the term which won’t wash out. We recommend that students wear clothes that they don’t mind getting paint on. Failing this, aprons and smocks which cover the arms are recommended. Tea, coffee and biscuits are provided during class for adults. Children should bring a small snack and a drink to class. Please avoid bringing food containing nuts to any classes as we have students with severe allergies. Please bring lunch if you or your child is attending a full day workshop. We need to know if you, or your child, has special educational needs, disabilities, health requirements or allergies. It’s really important that we are aware so that we can provide the best possible lessons. If you haven’t informed us about something that you feel we should know about, please do so as soon as possible.